Government of the Punjab has announced New Vacancies in Punjab 2018 in Daily Express Newspaper on 28/01/2018 in National Logistics Cell. 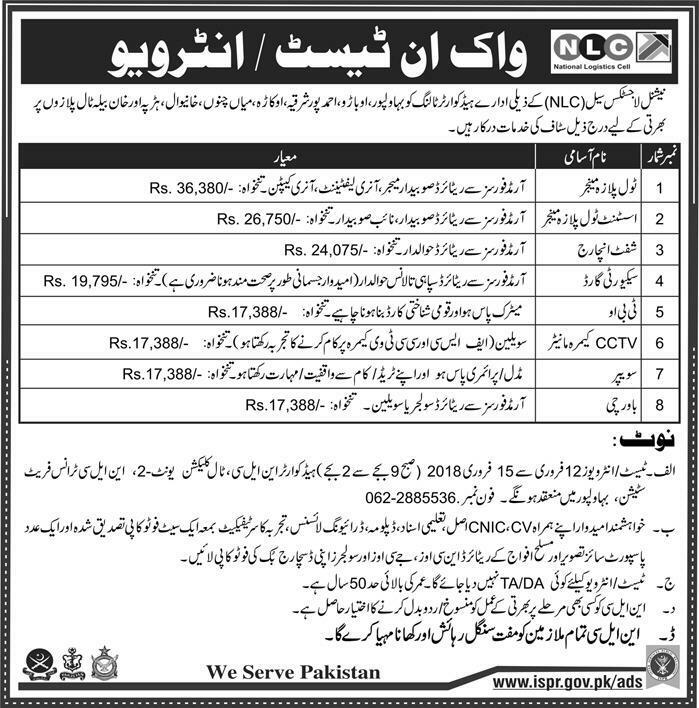 Jobs titles are as follows, Toll Plaza Manager, Assistant Toll Plaza Manager, Shift Incharge, Security Guard, TBO, CCTV Camera Monitor, Sweeper and Cook. These appointments are on fix salary. However company will provide free Residence as well as Mess Accommodation. Candidates who have required qualification and experienc may apply for these National Logistics Cell Jobs 2018. All posts are vacant in Bahawalpur, Obaro, Ahmad Pur Sharqya, Okara, Mian Channu, Khanewal, Harappa and Khan Bela Toll Plazas.